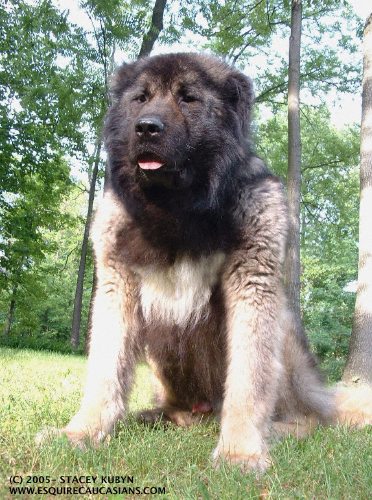 Champion FROL 31.5 inches tall (to the shoulder bone) with huge head and bone structure - we believe him to be one of the largest and best studdogs of true "bear type" in the world. Rated Best of Breed in the US by esteemed Russian Judge Polivanov, FROL descends from USSR, elite producing military dog FRANT, and is out of KS (protection certified) sire and dam. FROL is both an excellent, stable guard dog and gentle and loving with family with perfect judgment in public - traits he passes on strongly to his children and grandchildren. Price is $2000&up. $500 to reserve a puppy with required Application and References. Contract.